This case study focuses on the sled position control system, which moves the read/write laser assembly radially under the spinning CD. 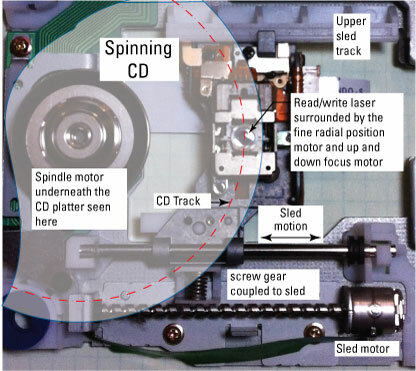 Check out the figure for a close-up of a CD/DVD electromechanical system. The first prototypes of the compact disc (CD) were independently developed by Sony and Philips around 1976, with the intended use of storing digital audio data. The use of CDs for other types of data storage followed. In 1995, Philips, Sony, Toshiba, and Panasonic introduced the digital video disc (DVD). To this day, related optical disc technology continues to develop. Spindle motor speed control: A control system regulates the radial velocity of the spindle motor; it’s responsible for spinning the disk at the desired velocity so the machine can read and write data. When you place a CD in a disk drive, you may have to snap it directly on a platter similar to the one shown. Laser focus control: The laser focus mechanism controls the read/write laser height by moving the laser up and down relative to the CD surface. Fine laser position control: The fine radial position mechanism is located in the same housing as the laser focus motor and controls the radial position by moving the laser radially, relative to the axis of rotation, with very high precision. The sled: To provide for large radial excursions of the read/write laser, the sled slides the laser read/write assembly from the innermost to outermost position (track) under the CD. The sled motor, through the action of the screw gear connected to the motor shaft, converts motor rotational position into sled radial position (and hence the laser) under the CD. The sled control system needs to have quick and accurate positioning capabilities via a control signal that rotates the motor. The tracks of a CD are consistently spaced along a continuous spiral. The sled position works with the fine track mechanism to keep the read/write laser on the spiral. To change tracks, the sled position control allows the read/write laser to jump to other portions of the disc. A DVD is a bit more complex than a CD because more than one layer of data is stored on each side of a DVD. But the laser focus control system sorts this out.